I love Chinese chicken & sweetcorn soup so I decided to use the leftovers from a roast chicken dinner to produce this. Served with a hunk of crusty home-made bread, it made a filling lunch for 4 or could have been stretched easily to serve 6. 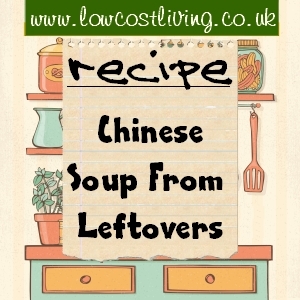 It’s not greatly different to the Chinese chicken & sweetcorn soup you would get from a takeaway or in a restaurant except that it is a little heavier due to the potatoes, which makes it a meal rather than a light starter soup. This really isn’t meant to be a fixed recipe, it’s more of basis to give you an idea how you can turn what a lot of people would just waste or at best compost, into a delicious meal. I used a pressure cooker, mainly for convenience and speed, but the same could have been made just using a large saucepan with a lid and more time, perhaps an hour simmering. Chop the onion and garlic finely and add to heated oil in the base of the pressure cooker. Gently fry for about 5 minutes to soften and begin to brown the onions. Add the water and the chicken carcass broken up into the pan, turn up the heat and place the lid on. Pour the liquid through a sieve into another pan. Allow the contents of the sieve to cool so you can handle them without burning your fingers. Remove the chicken bones and any meat. Add the cooked onion back into the pan. Add the cooked potatoes and blitz with a hand liquidiser in the pan. Add the stock cubes, dried ginger and taste – it may be salty enough just from the stock cubes. Add salt and pepper as required. Add the sweetcorn and gently simmer for 5 minutes. Whilst the soup is simmering, remove any meat adhering to the bones and chop or pull apart any larger pieces of meat. Add to the soup. Mix the cornflour with a little water and add to the pan, keep stirring until it thickens. If not thick enough, add a little more cornflour. Fresh ginger is a little better if available. The number of stock cubes depends on how strong your stock has turned out. I found 3 Oxo was right this time. The potatoes are optional, of course. If you had mashed potato left over that would work but I don’t think roast would be quite right. Another option we have used in the past is to add a pack of noodles to the soup to bulk it up. The soup can be frozen into portion sizes.